Put your cursor on the topics of interest listed above and a number of pages will be shown that you can then visit. ← Check legend for numerous Louisiana resources. Place your cursor on each page title and see what pops up. ← Check legend for numerous Louisiana resources. Place your cursor on each page title and see what topics pop up. BECOME RADICAL FOR YOUR FAITH! Do not be satisfied! Expect more! This is a personal website and has been for many years. It is product of lay person based in the Houma-Thibodaux Diocese of South Louisiana. For a brief history of how this website came about, click on the page titled History/,,,on the legend immediately to the left. A unique portion of South Louisiana began to be built about 6,000 years ago when the Teche Delta Complex began to be formed by the "Great River". That was about the time God entered into his covenant with Abraham. The Houma-Thibodaux area of South Louisiana was formed during the formation of the Lafourche Delta Complex about 2000 years ago. It was during that delta complex formation that Jesus was born in the Holy Land. Much to think about in that. 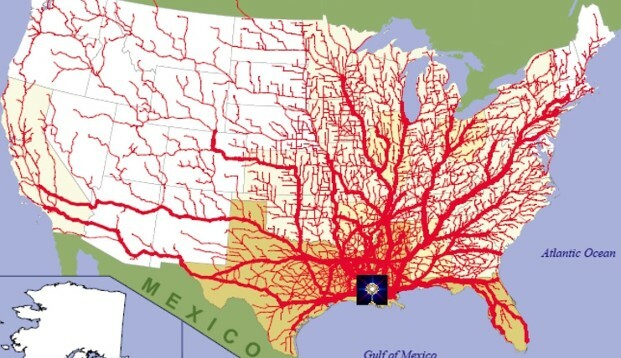 Extreme South Louisiana was formed by the waters that carried the best and most productive land that was between the mountain ranges in the east and the west and then northerly all the way into Canada. The land of 31 states northerly into Canada. This modern delta land we call home has accumulated from nearly 40% of the land mass of the United States over thousands of years. Want to know more about that, click here. This personal website is published in the most southernmost land area formed by those living waters. It was first published to serve and network Catholics all across Louisiana as well as those Louisianians that have relocated across this country. It is first meant to be a tool to network for evangelization purposes. Although located in Houma-Thibodaux Diocese, this website does not represent the Diocese of Houma-Thibodaux nor does the Diocese of Houma-Thibodaux in any manner endorse its contents. Of course, the Diocese of Houma-Thibodaux has its own website. If you want to see some of the outstanding diocesan resources that are available there to evangelize, click here. Many visitors to this website come to search for Catholic events, ministries, etc. across the State. For a listing of specific Catholic events sent in by Catholics all across Louisiana, visit our internal page listed on the legend to the left that is titled "Louisiana Front Page Events". Additionally, many Catholic ministries across Louisiana are listed in the legend to the left. Then, there are other reasons to visit this website. located in Alexandria, LA, click here. Revelation 10:10 reads as follows: "I took the small scroll from the angel’s hand and swallowed it. In my mouth it was like sweet honey, but when I had eaten it, my stomach turned sour." Commentary on that verse reads as follows: The "small scroll was sweet because it predicted the final victory of God’s people; it was sour because it also announced their sufferings." (USCCB). To simply profess, by our mouths, the great Glory of God is sweet indeed but then to chew and swallow it, and then to subsequently try to live it out, can be quite sour to the taste. Suffering is often the result. It is a "Bittersweet" experience we must face when we attempt to live the Gospel message instead of just speaking it. if we are true to who we profess ourselves to be, we cannot run from the hard responsibity it is to live the Gospel in all situations. Oftentimes, we must go to places we would rather not go. Do things we would rather not do. Remember St. Peter: "Quo Vadis" "Bittersweet" is not a word that is used lightly is this effort! In connection with what is stated above, commencing in February of 2019, the author of this personal website began a new section of pages within it. You will see this new section grow greatly in the future. It will be an effort to describe a personal journey of 33 years. Not at journey that would interest many people, if it were really about the author, except that what has been discovered in that journey should interest all because of its real effect on us all. This new section starts immediately below "Contact Us" on the legend on the left hand side of this page and is titled "Louisiana - It's Darkness of "Just-Us". Just click on that title to begin now, or read further, if you wish to know more foundational information. Yes, at the bottom is exactly where this new series of pages belongs! The pages will example the negative side of the spiritual battle we must fight. 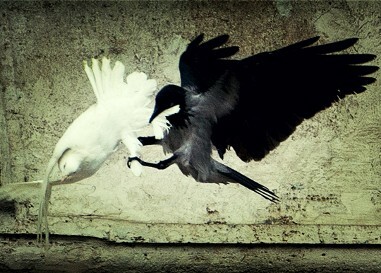 A battle of cultures ... Light against Darkness ... Life against Death. This darker or negative side cannot be raised to the level of prominence along with all else on this website that is so positive. This new section of this website will attempt to evidence one area of the darkness in Louisiana. A darkness that manifests in many ways because, as you will later read, it is in the legal justice system. The only reason the author can even know about it is because that is where this author, as a non-attorney, has been called to journey for 33 years. Many of those years have been pro se. The author has first-hand seen persons, that have been allowed to sit in seats of earthly authority, over persons perceived to be "lower" people, act unjustly. Those acts will be evidenced. As scripture repeatedly shows, that is not a new phenomenon but one often experienced by many throughout history. That is not a good reason to accept such activity in Louisiana. In Louisiana, there is a two-tier system of justice. What some get penalized for, some walk freely from. This will be particularly and expressly demonstrated by what will be displayed in these new pages. The system in place now is selectively oppressive and poorly self-regulated. Of course, the persons in power will say that this is all ridiculous. They will say we are in good hands. But, consider the source of that response. It is not about any particular political party or individual persons (many deceased). Individuals can change party affiiation depending on what is the most opportune for them at a particular time. No, it is about a self-perpetuating "system" that crosses over party lines. It is also much bigger than individuals as well and outlasts any one person. This particular story personally began for the author in the second term of Governor Edwin Edwards in 1986 and it has continued until today through the following administrations. It is an interesting and amazimg phenomenon that has worked equally well through each. Interestingly, on the night of Governor Mike Foster's re-election in 1999, in accepting victory over William J. Jefferson (an attorney with his own share of legal troubles), Governor Foster boldly stated something like: "Romans 12 is my favorite book in the bible. Especially, Romans Chapter 12 verse 16. That is my favorite!" To be clear about exactly what he cited, that scripture passage reads as follows: "Have the same regard for one another; do not be haughty but associate with the lowly; do not be wise in your own estimation." That was a profound scripture to be cited by the governor that night. If he was being truthful that night, he should be very supportive of this website's new work. Most often, the lowly are exactly the ones who can be the worse hurt by persons with power who are in positions of authority. (For much more on the "little ones", click here.) There has always been persons that were willing to take from the "smaller" people of Louisiana. BP believes us to be small. But then, BP believes all are expendible, and as you will read, for the right price has further equated small people as to having the worth of pigs. As you will later read, first ARCO, and then its successor in title (BP), are material players in these pages. There also are other persons that will be identified that were willing to participate in the wrongdoings that will be described. They have participated for their own little share of the "pie" that they are allowed to keep. That piece of pie can take many forms. Oftentimes, one might be catapulted to the highest levels of one's profession. LIke chickens feeding on cracked corn from the hand of their "master". They run from here to there looking for the next "kernel" of corn that might be thrown their way. Then, there are many other persons, those that are allowed to simply exist, if they just stay silent about what they see. These are often the good men and women caught in a legal system that can discipline harshly, if one dares to come into conflict with its power and/or with the way it operates. Forced into silence by what is called an attorney professional code. One outspoken attorney, openly speaking their concience in public about an unjust legal system, can easily become an example to all others about what not to do. After personally filing many complaints over the years, it is apparent that an effective tool for selective discipline is LADB. With that tool in place the system can control all with law licenses. Each must walk in lock-step. Our daily ives consist of byzantine layers of spiritual warfare with many spiritual battlefields around us. For most, this reality sounds ridiculous. For the author, and many others, it is not ridiculous at all, but extremely real. It is more real...than what may seem is real. It is so real, in fact, the Church calls the living members the "Church Militant". That name is not given without meaning and obligation is attached to it. For this author (a non-attorney), this spiritual battlefield that you will read about on these new pages, has played itself out in the courtrooms of this State and the cold halls of various regulatory agencies. These are the bodies that have been given the authority to address environmental issues across Louisiana. Those issues effect each and every one of us and our families in numerous ways. These new pages will attempt to ellaborate on those ways and how they affect the public. The visitor will see courts and agencies filled with good people that have failed to do their job for the public good! Why? The author believes it is primarily because there is a failure to recognize that it is foremost a spiritual fight against evil and the good people involved have not asked for the belief level and/or the power required to charge upon its gates. For, as believers, if we would jointly charge upon those gates with faith, the darkness behind those gates could not prevail against us. For the last 33 years this author has seen good people, on occasion, do some really bad things. There had to be individual consciences pricked over certain actions. No doubt those persons have carried this burden for years. To say all this is not first spiritual is very secular, naive and simplistic. It is deadly because Sin Kills Eternally! The first step in failure is to not admit the enemy that exists. As you will read, because of the source of the wrongdoings that will be evidenced, the effects will go far past the State's environmental matters. They will go to all matters before the courts of this State. They will go to the highest body of judicial authority in the State of Louisiana. 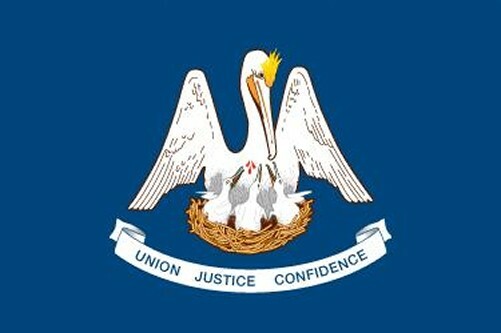 An authority that (at least in these cited proceedings) has failed to fully and equally fulfill its constitutional obligation "to secure justice for all, preserve peace, protect the rights, and promote the happiness and general welfare of the people" as mandated by ARTICLE I - DECLARATION OF RIGHTS of the Louisiana State Constitution (1974). It is the author's belief that we have a State Constitutional Crisis when it comes to our judicial branch and it remains to be seen if there are other branches willing and/or able to do something about it. For reasons, the author has now determined that this is the time that these actions must be publicly exposed. 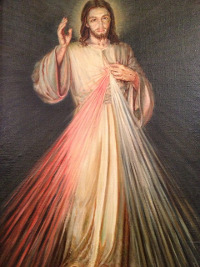 Be assurred, this attempt to reveal certain truths, that will impact the lives of many, will try to be done with humility while prayerfully reflecting on the Litany of Humility (a private devotion) as found in various editions of the Pieta Prayer Book. It is not the author's intent to hurt any one indvidual but the truth must be told. Facts will try to be stated succinctly for all to make their own determinations about the wrongdoings and hopefully others, with the power and the authority to do something about such matters, will act appropriately. It is particularly noteworthy that this battle is centered on a small tract of land in a civil parish that is named "St. Mary". Also, the crime first being committed in 1985 was against an elderly woman and she was a widow. The widow of a man named "Joseph" Blanchard. In fact, the name "Blanchard" derives from the Old French word Blanchart which meant "whitish, bordering upon white". So, in the middle of beautiful St. Mary Parish, Louisiana, within the Tech Delta Complex, this work will attempt to respectfully bring "light" into this darkness. Some "white light" to try and reveal the dark actions that first began to protect a politically powerful attorney (now deceased), and the persons closest to him at that time, so they could take what that widow had of value. This system's protection of a person has evolved over time into an effort by the system to protect the system that wrongly protected one of the system. A "top tier" protection. God protects widows (like Betty Blanchard). If one takes advantage of and/or injures or damages a widow and/or takes her possessions, then the ramifications to the perpetrator(s) shall be great. These actions will now be exposed to a light for all to see. 7 God gives a home to the forsaken, who leads prisoners out to prosperity, while rebels live in the desert. 9 The LORD protects the resident alien, comes to the aid of the orphan and the widow, but thwarts the way of the wicked. 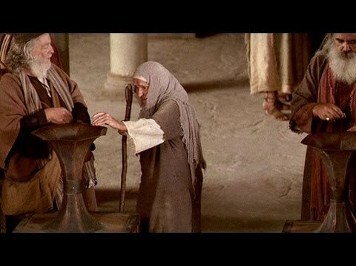 21 You shall not wrong any widow or orphan. 22 If ever you wrong them and they cry out to me, I will surely listen to their cry. 23 My wrath will flare up, and I will kill you with the sword; then your own wives will be widows, and your children orphans. 39 seats of honor in synagogues, and places of honor at banquets. Yes, and Betty Blanchard (the elderly widow about which this story will be told) gave from the last of what she had to give. One cannot expect someone to be more than they are. She was who she was. 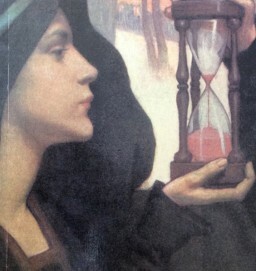 She gave from the measure of her ability to the end of her earthly life in 2007. But especially, verse 52, that reads: "He has thrown down the rulers from their thrones but lifted up the lowly." Over the years, many (oftentimes reporters) have commented to the author that a book should be written, or a documentary produced, about all these matters. To those reporters who are reading this, it is understood that many of you would like to have investigated deeper into these matters (and many have tried) over the years. The author understands that due to the 24-hour news cycle, and then due to the need to first report only the latest and greatest "hype", and then due to being compelled to move immediately onto the next "hot" story, most reporters cannot stay on a story like this long enough to do what is needed to report it fully. For such, the basic foundational information will be made available to you 24/7 on these pages and then any interested person can target a particular topic of interest and quickly find out where to go to get more information about that topic or angle. This information and its limited narrative will continuously be added to so it will change regularly. So, when your return, it will get bigger and more clear. You can begin to read about these matters by reviewing the legend on the left upper corner of this page and start at "Louisiana - ITS DARKNESS OF JUST-US" or you can continue to read below before proceeding there. 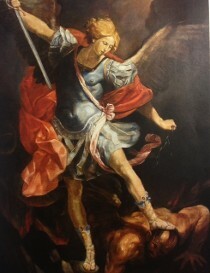 Holy Michael, the Archangel, defend us in battle. Be our safeguard against the wickedness and snares of the devil. May God rebuke him, we humbly pray; and do you, O Prince of the heavenly host, by the power of God cast into hell Satan and all the evil spirits who wander through the world seeking t the ruin of souls. Amen. For more information about this prayer, and Pope Leo XIII and Fatima and now, click on the image of St. Michael. Precious Blood of Jesus across this nation! Techniques of evangelization are good, but even the most advanced ones could not replace the gentle action of the Spirit. The most perfect preparation of the evangelizer has no effect without the Holy Spirit. 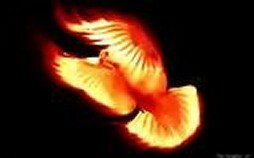 Without the Holy Spirit the most convincing dialectic has no power over the heart of man. Without Him the most highly developed schemas resting on a sociological or psychological basis are quickly seen to be quite valueless… It must be said that the Holy Spirit is the principal agent of evangelization: it is He who impels each individual to proclaim the Gospel, and it is He who in the depths of consciences causes the word of salvation to be accepted and understood. But it can equally be said that He is the goal of evangelization: He alone stirs up the new creation, the new humanity of which evangelization is to be the result, with that unity in variety which evangelization wishes to achieve within the Christian community. Through the Holy Spirit the Gospel penetrates to the heart of the world, for it is He who causes people to discern the signs of the times- signs willed by God- which evangelization reveals and puts to use within history. Excerpts from paragraph No. 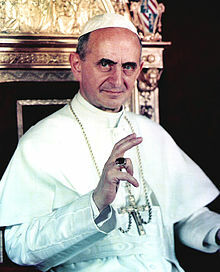 75: EVANGELII NUNTIANDI - APOSTOLIC EXHORTATION OF HIS HOLINESS POPE PAUL VI TO THE EPISCOPATE, TO THE CLERGY AND TO ALL THE FAITHFUL OF THE ENTIRE WORLD. A special place created for these times! 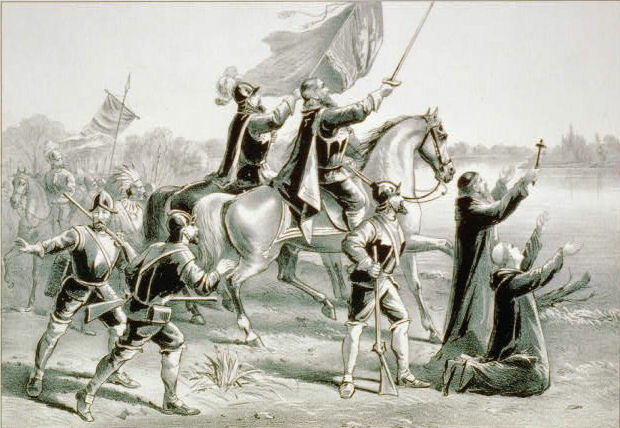 On May 8, 1541, Hernando de Soto, the first westerner to see the great river, seeing it full of life, named it "The River of the Holy Spirit". 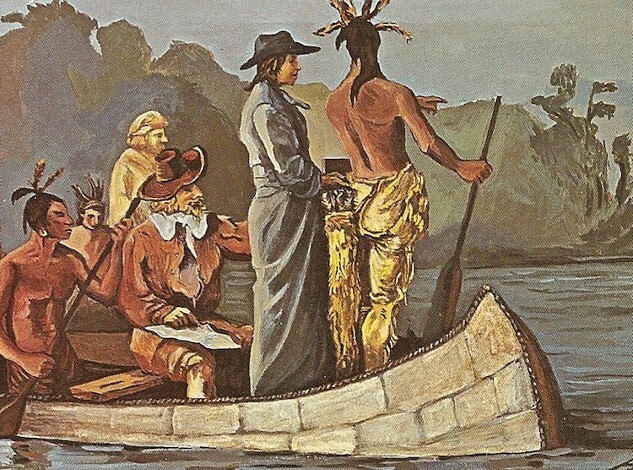 It is exactly that same great river (formed for a time named "River of the Holy Spirit" and for a time named "River of the Immaculate Conception") that formed the State of Louisiana for thousands of years from the most productive land located between the eastern mountain ranges and the western mountain ranges of America and all the way up into Canada. Today, that unique land is symbolized by the mother pelican sacrificially feeding her young (or the Eucharist). Want to know more about the symbolism of all that, click here.